Bombs Away! 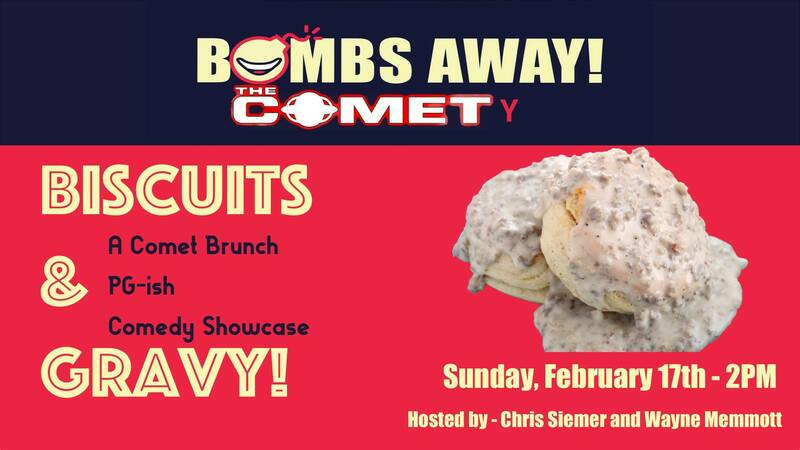 Comedy and THE COMET have teamed up to bring a ONE OF A KIND experience to Northside, a FREE Comedy show at BRUNCH! Each month we bring 3 of Cincinnati’s top comics to perform for you as you let your brunch settle. Whether you eat Biscuits and Gravy, Crepe Cakes, or drink the Comet’s famous Bloody Mary, we have something for everyone. * Brunch service STOPS at 2PM, so arrive early to place an order. * Seating is limited and first come first serve.